Fun Facts from Solo: A Star Wars Story Expanded Edition – Easter Eggs, Legends Connections & More! With the Solo: A Star Wars Story novelisation be Mur Lafferty now released, it’s time to dive into all the facts, easter eggs and Legends connections scattered across the novel. Yes there will be some minor spoilers in this article. After Han injures Lady Proxima, Moloch believes she might execute every underling that witnessed the event, so that word doesn’t spread across Corellia. Han notes that Corellian hounds (as seen with Moloch, in pursuit of Han & Kira) teeth regenerate. This is due to the creatures powerful bite, as they bite so hard and viciously that their teeth break off in their victims. The Santhe Corporation was mentioned in the game Star Wars: The Old Republic and the novel Darth Plagueis back in Star Wars Legends continuity. Han mentions that their presences on Corellia as one of the major ship manufacturers. Something new established in the novel and also in a deleted scene from the film, will be that of Corellia’s fishing industry. During the deleted scene Han & Kira flee from Moloch and his Corellian hounds through one of Corellia’s fishing markets. It would seem that the fishing industry is the second biggest option for employment on Corellia after shipbuilding. The novel also brings to light what pay is like for Officers employed by the Empire is like, and it isn’t much at all. Which can make Officers open to bribery. During Han’s time in the Imperial Navy, he flew TIE Infiltrators as Onix 9. Onix Squadron was originally established back in Star Wars Legends in reference materials and the X-wing miniature game. The TIE Infiltrator is the more official name for the Heavy TIE Fighter or TIE Brute which was new TIE Fighter scene during the Kessel Run Chase. Han describes flying with the fighters droid brain to be frustrating. Onix Squadron flies against a small insurgency using Z-95 Headhunters, which have been Canon since Star Wars: The Clone Wars. But have appeared again recently in the Poe Dameron Comics. Tobias Beckett originally had a fourth member with his crew in Mimban named Corso. Corso helped Beckett and co infiltrate the Empire, but was then killed soon after during the battle of Mimban. The novel confirms that Chewbacca DID NOT eat any humans during his imprisonment on Mimban. Beckett and Val recall how they met Rio. Catching him trying to steal their speeder, but were impressed with his skills and he wound up joining their crew. As Han, Beckett and the other members of Beckett’s crew share stories around the campfire the night before the planned Train Heist, Chewie talks of his desire to liberate his homeworld Kashyyyk, which directly ties into the events of Chuck Wendig’s Aftermath: Lift Debt. In that novel Han and Chewie do in deed liberate Kashyyyk from the Empire. Range Troopers see themselves as some of the most elite troopers in the Empire and look down on other stormtrooper variants. This information was established in the Solo: A Star Wars Story official guide. Han states that there was enough coaxium on the Imperial 20-T Railcrawler conveyex transport (The train) to power an entire fleet. Which as Alex asks, what was Maul planning to do with all that fuel? The Crimson Dawn is described as likely to be the strongest of the five criminal syndicates in the galaxy. Kira confirms that she was sold into slavery to Crimson Dawn by Lady Proxima as punishment for helping Han escape Corellia. Dryden Vos’ taxidermied creatures that we can see scattered in his office in glass chambers are in fact still alive. Kira notes that fate is reserved for beings who encourage Dryden’s wrath. Beckett says that he killed Aurra Sing whilst on a job for Crimson Dawn and that he was even paid a bonus for offing the bounty hunter. 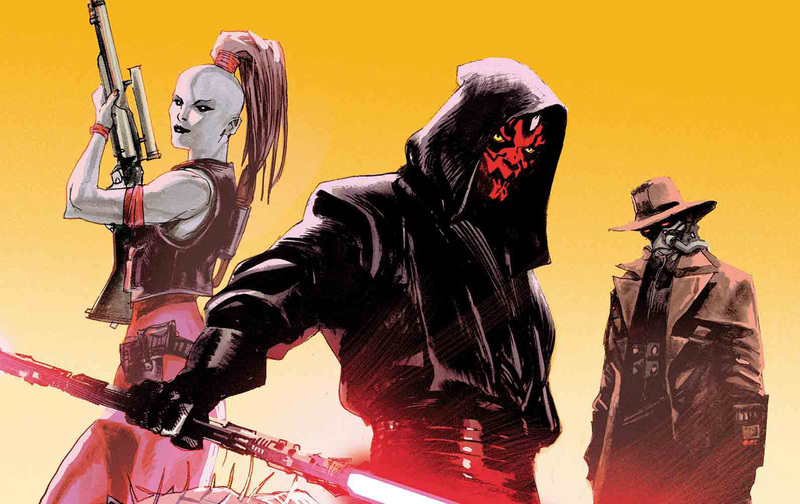 It should be said that Aurra and Maul have worked together before as seen in the Darth Maul comic. Kira admires L3-37’s ability to forego her programming. Which maybe inspired her to turn against Dryden, who forced her to be his willing servant. The final planet that we see in the film where Han wins the Millennium Falcon from Lando was in fact Numidian Prime. Which the official Star Wars databank as updated upon. And finally (this is the big one) an epilogue at the end of the novel between Enfys Nest, Saw Gerrera and Jyn Erso. During this epilgoue Enfys gives Saw the coaxium for his growing insurgency. Alex from Star Wars Explained does go into more detail on this epilogue here. But those were the many little fun facts, easter eggs and references to Canon and Legends material scattered throughout the novel that he unearthed.